After having 4 elm327's connected up to the Tech2 to keep up with communication and reverse engineer bis and pieces.. Im really seeing the limitations of the device. If I see another "Buffer full" message, I think Im going to spontaneously combust. It seems a smart chap, Michael, has developed a AVR device which can communicate over VPW. To me, it looks like a perfect opportunity to develop a cheap device to communicate over VPW without such limitations. After briefly going over the schematics, looks like we can easily port it over to an arduino mega comfortably.. just might require changing the crystal to a 4Mhz instead of the 16Mhz one to minimize the required changes in coding. 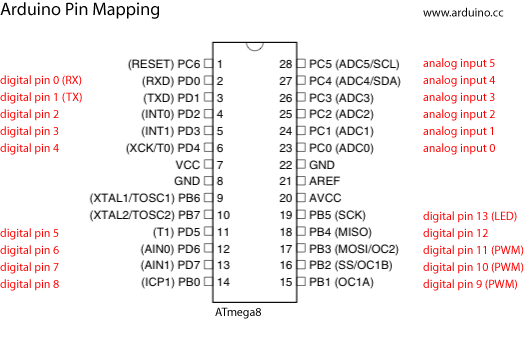 A nice little diagram that depicts which pins correspond to what from ATmega8 to Arduino..
Now porting the code to Arduino. Since I dont know the AVR laguage very well.. just a few inconsistencies, makes it hard to tell what certain things are doing such as setting up the serial ports ect. I know I can import AVR libraries, but this doenst solve the serial port setup delemas and its still nice to be able to understand each part of the code incase changes are ever required. Hoping to give this a real crack and see if we cant get a device up and running, Just go through each section of the code, understand what its doing and port it to an arduino appropriate format. My end goal here, is a VPW device, which can have custom "controls" embedded into it. For me this would be getting it to respond back as a fake PCM or TCM ect while reversing the Tech2 instead displaying everything over serial port which leads to our buffer full issues and missing vital frames. I think that this is a good idea. I would really like to see a cheap VPW hardware device become available. What you are looking at would most certainly work. I am an atmel man myself, and prefer it over pic tools and architecture, but have you considered staying on pic, and porting the code to run on the elm clones? There is a 5 pin pic programming header on the side of the board, and if you do that, then after the firmware is developed (and of course thats the hard bit) your talking $10 worth of hardware and a quick flash to have a working device. Yeah thats also a possibility. I guess if we can understand this coding well enough since its a a working example, it will be much easier to adapt to any device we want. Will need to do some pcb pin tracking to see what pin goes where. Only really need 4.. VPW TX and RX, and usb TX and RX. The rest should be hooked up accordingly I guess for power,gnd and the LED's. I preferable dont want to have to use header files.. so compiling into one file will be what Ill be looking to do. #define us2cnt(us) ((unsigned int)((unsigned long)(us) / (1000000L / (float)((unsigned long)MCU_XTAL / 1L)))) //So, converting microseconds.. into.. ?? #define WAIT_100us	us2cnt(100)	// 100us, used to count 100ms - so all that us2count is converting 100microseconds to 100milli seconds? Is that right? So thats the end of that file! Only issues is reading up on equivalent timer controls on the arduino. And also totally confirm that timer/microsecond equation up top. This file does not return or have any parameters, it is used to initialize the vpw connection. I wont paste the entire code this time.. will go section by section again. Thats enough for today.. will have a look at some more tomorrow.